North Country Chamber of Commerce board. 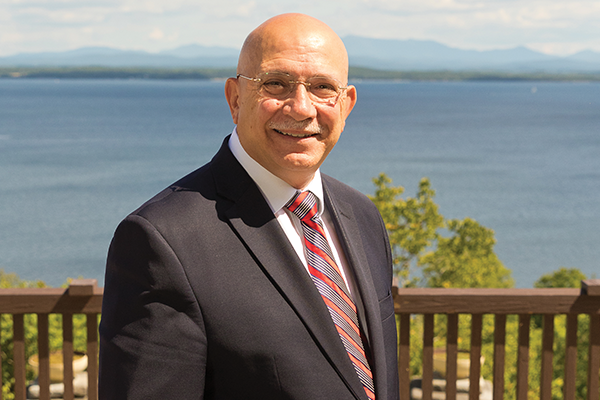 DiPasquale targeted his early career and education toward parks and recreational administration, and admittedly did not have a career plan to go into higher education. Shortly after completing his graduate program at Northeastern University, he joined Springfield Technical Community College in Massachusetts to serve as its Director of Admissions. He spent 20 years in Springfield, serving as a member of the school board, the City Council, and narrowly missed victory following a campaign for mayor of that city. Clinton Community Colleges’ Institute for Advanced Manufacturing (IAM) has been a catalyst for collaboration between the college and the greater community— a philosophy DiPasquale believes is essential for success. “We’ve talked to close to 100 local businesses and met with every school district in the area,” he shared proudly, “From a philosophical view- point we want to provide opportunities for everyone to be a part of Clinton Community College.” Alongside other recent initiatives, the IAM is helping CCC show the community what education can do to open doors, and what it means to the college to be a good community neighbor. Recently, DiPasquale sat down with SB to share his career insights. RD: The first one was hard work. The best compliment I ever got along the way was from a college president who told me I was the only person who he never had to tell what to do. To me that meant that you anticipate what you have to do, and then you do it. What I’ve learned along the way is that you never look only at today. You should always look beyond today to the future. Try and figure out how the decisions you make today will impact the future. This is particularly true for an institution. You are dealing with students’ and employees’ lives. You’re overseeing education – and that’s going to have an impact that will change people’s lives. My philosophy is to clearly anticipate how every decision I make will impact the lives of the people who study and work here. Make decisions that are going to have a long-lasting effect. RD: I lost my dad when I was 15 years old, and I had a hard time after that. At the time I had a cousin who was teaching, and had earned his Ph.D. He pushed me to go to college. I credit him with changing my life. During that difficult time, I also had a coach who literally walked into my house and pulled me out of bed and got me to practice. If he hadn’t done that, I don’t know where I’d be today. It was those two men who shook me up when I was young and having a difficult time. I had people in my life who did not allow me to sit back and drift off. SB: What did you learn from your early mentors? RD: I clearly attribute the values I have today to my hometown of Mount Morris. It is a small Italian community outside of Rochester. The people embraced me, challenged me and taught me that hard work will pay off. I credit them for teaching me good morals and good ethics, and that honesty, integrity and hard work would help me to be successful. SB: What advice would you give to the next generation of leaders? RD: I have watched different generations learn and go through their educational process, and still the advice I would give is no different than the advice I got. The ticket to success is education, hard work and not being afraid to take chances. If a window of opportunity opens, don’t be afraid to look through the window even if those opportunities are not even part of your college major. Always look forward. Don’t be afraid to take challenges, and know that you have to be com- mitted to hard work and doing your research. SB: If you could start your career over again, what would you do differently? RD: If I had the opportunity to go back to school and study some- thing, it probably would be law. It amazes me how much of my life and my decision making incorporates having a good understanding of law. It is in everything I do, from personnel decisions, to academic decisions, to business decisions. SB: How does your foundation in sports play out in your work today? RD: I credit athletics for who I am as a person. It teaches hard work, discipline and teamwork. and what it means to be successful and what it means to lose. In many ways, I still am a coach. What you’re always trying to do is find the best positions for your players and for your people. It is part of the book “Good to Great” —putting everybody in the right seats. In athletics all those skills come with you. The ability to manage and work with people and the ability to bring out the best in them. If you are coaching them, you are helping them to be successful. If they are successful, then the organization is going to be successful. Successful teams win lots of championships and championships in higher education means helping young people be successful and achieve their dreams. RD: At Springfield Technical Community College, SUNY Brockport, Middlesex, and recently here at Clinton Community College, scholarships were left in my name. On my last day leaving the office at Springfield, my colleagues all lined the hallway to say goodbye. I was already choked up, but at the end of the hallway they had a big poster that indicated they had established a scholarship in my name. What better gift is there than the ability to continue to help students at that institution? Knowing that my peers recognized me in that way was special. SB: If you could have dinner with a well-known person, who would it be? RD: I’ve always wondered how cool it would be to have a chance to sit and talk to the Dalai Lama. He has this incredible philosophical view of the world. He isn’t segmented into any one area. I’d really like to listen to the views he has about presidents and culture. RD: When I was in college I used to race cars on a quarter track near Buffalo. Not just on the street, but real car racing. RD: I really want to know where I live, so I spend a lot of time exploring the many communities in the North Country. And I mean, really exploring – I am trying to visit every single community in Clinton County. When I first got here, every Sunday I would get in the car and go visit another town. Some you go through in the blink of an eye, but others surprise you. It’s really fun to do it. After you get to know these small towns a little better, when you meet someone from that town you can relate to them better too. RD: There is one thing that keeps everything in perspective for me as a college president. When I am standing onstage shaking the hands of students who have just graduated. That is the highest privilege. It truly is the most inspiring thing. Knowing that after all the ups and downs of their academic career, we helped that young person achieves their dreams, and that will hopefully change their lives. It gives me goose- bumps to watch their faces, and their families faces, and to be the one who actually shakes their hand. Perhaps the most inspiring thing for me is to watch our students be successful.